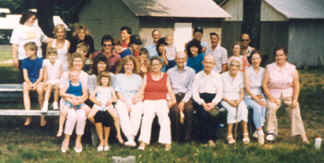 1988 reunion of the John Andrew Miner clan -- forerunner to today's National Minerd- Minard- Miner- Minor Reunion. The John Andrew Miner reunion began in July 1986. When Susan Pletcher Miner Trimpey departed from her loved ones and family in 1985, it was decided at this special occasion we would gather together yearly to remain in contact. Our roots were from the Kingwood area. The Kingwood Picnic Grove was approved to have a reunion. We didn't have a definite date and pavilion reserved. In 1989 none was available, so we all met at Orion and Evanell Nicklow's home. Mark Miner and his uncle somehow found out about this clan of Miners. At this gathering we decided to have a definite date and get a pavilion definitely. Mark Miner had continually been coming to find more information about these Miners. He did not know of any relationships except the Ephraim Miner family, therefore we found a lot about his family. Then we joined with them and all Miner, Minerd, Minard, Minor kinfolk are welcome to come.